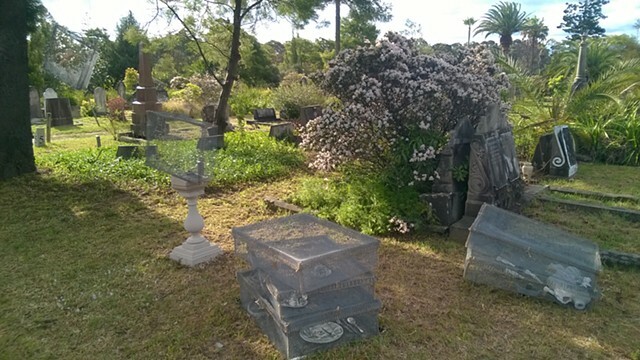 Stratum III is an interpretative artwork that is a response to the cultural, historical, social or metaphorical aspect of Rookwood Cemetery, as seen by the artists. Suitcases representative of passage of time, movement from one instance to another. Lined up as if on a departure platform, one’s suitcase holds all that is precious, important, valued, carriers of an individual’s journey through life to here, their physical final destination. Hand built ceramic broken angels, intermingle with doll parts, remnants of a lost childhood that dance with postcards and mementos. The final empty suitcase represents the ‘letting go’ of physical possessions, allowing the lifting from the earth. The cases themselves sit there, like social remnants, cultural detritus.